Jennifer Vogelsong wrote an interesting piece for the York Daily Record/Sunday News about the search for authentic experiences in Gettysburg and Lancaster, Pennsylvania. 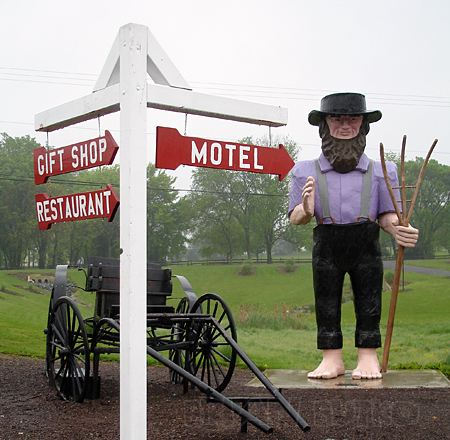 Much of the public face is found along the Lincoln Highway/US 30 but she finds that the best places are a block or two away or along the back roads. She was inspired by the December issue of National Geographic Traveler that ranked the two destinations among the most important historic places on Earth — and fourth worst when it comes to sustainable tourism, ie how authentically they preserve the past, manage tourism, and withstand development. Read more of Jennifer’s travels around these two areas and York in her blog Explorer’s Backpack. This entry was posted on December 3, 2008 at 12:50 pm and is filed under food, highways, history, museum, Road trip, roadside, signs, travel. You can follow any responses to this entry through the RSS 2.0 feed. You can leave a response, or trackback from your own site.